Battery Cycle Life Tester – Crest Test Systems Pvt. Ltd. The Battery Cycle Life Tester is useful for carrying out Life Cycle Tests on Plate-type, Tubular, SLA, and VRLA batteries. The Battery Cycle Life Tester models allow testing of the full range of lead acid batteries, right from motorcycle batteries to those used in UPS systems. 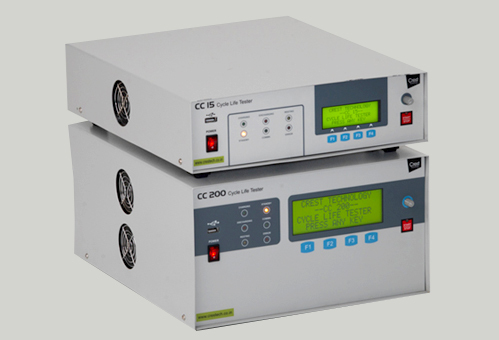 The Battery Cycle Life Tester is designed keeping in mind the need to have a complete system that helps manufacturers of all kinds of batteries to test their battery for quality compliance as per the specified standards of manufacturing. In addition to this, our product also caters to the requirements of the battery servicing industry. Software facilitates uploading of test data from the instrument for viewing present as well as past test results in a graphical and tabular form. It also allows saving, retrieving test results and printing test reports for management and customers.